Given three bowls: 8, 5 and 3 liters capacity, divide 8 liters in half (4 + 4 liters) with the minimum number of water transfers. Note that the 8-liter bowl is initially filled with 8 liters of water and the other two bowls are empty - that is all water you have. 7.	pour the 3 litres back from the 3-litre to the 8-litre bowl (and that’s it – in 8-litre bowl 4 litres). Why isn't "pour 4 litres from bowl 8 to bowl 5" a solution? because you can't be sure that you're pouring 4 liters into the 5th bowl. it might be 3.5 liters or 4.5 liters. using the solution is the only way to be sure that there are 4 liters in each. you have to completly fill the bowl you are pouring into or completly empty the one you are pouring. 3. Fill 5 liter container and empty 1 liter into the 3 liter cup containing 2 liters from step 2. 8. Empty 3 liter container. This leaves four liters in both the 8 liter and 5 liter containers and zero in the 3 liter container. It requires 7 pours. Starting with 8L bowl full, this is what each bowl will have at each step. No water being added or removed from original 8L of water. * Ignore below. I missed the stipulation that you could only use 8 liters of water. I used the same assumption from the 1st one that we had unlimited access to water. Here's an alternate solution. It has more steps (I combined a couple steps below), so obviously it is not the correct solution, but I worked it out so I figured I'd post it. This can be done in one pour if the bowls are symetrical. - pour from the 8L bowl into the 5L bowl until the water reaches the top-edge of the bottom (very hard to explain, but try it in a glass or bowl to see). This will be exactly half of the volumn of the bowl and therefor = 4L. Having three bowls: 8, 5 and 3 litres capacity. Share 8 litres in halves (4 + 4 litres) pouring water the minimum times. 8 pours... not the best, but close. 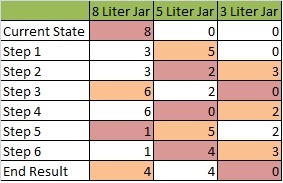 Wouldn't it be easier to fill the 5 liter bowl and pour the remaining 3 liters into the three liter bowl and fill the three liter bowl to the top from the five liter bowl? That would be three steps. No dude, thats actually 7 steps u did, not 8. You repeated that last step for no apparent reason, your solution is as good as the first ones. It is different but same number of steps Nice job!